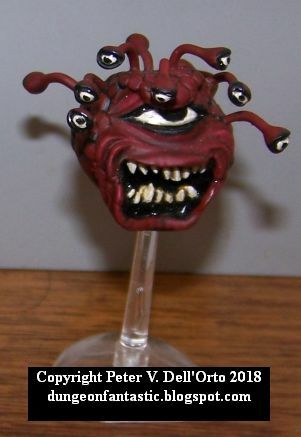 It's a Kenzer & Company Hackmaster beholder mini. I traded some bat swarms for that flying base, too, because I didn't like the one the mini came with. I also remember putting the base in and then realizing was a mistake, so I had to remove it and drill a new hole. The top and bottom halves didn't fit together, either. So I had to make a greenstuff connection, sculpt that into armor plates like the rest of the figure, and make sure it glued together well. Remember way back when I was groaning about frosted minis? This mini was one of the ones that frosted up, although it actually frosted up a year before that complaint - the beholder might have been the first one I had frost due to humidity. It took a major recovery job, and lots of re-painting, to get it back to this state. This guy will see the tabletop again, but maybe not for a while. It took a horrible toll on the PCs, who were channeled into a killing zone where it could play its anti-magic ray and various eye rays on the party without retribution. Notice its order of attack, too - scouts first, then using its charmed ally to kill the cleric (who wasn't affected by the anti-magic ray), and then the wizard (so it could focus its attention elsewhere.) It was a spherical, hovering TPK. We started off in town, with the PCs completing a long list of purchases to be ready to fight the dragon. They gathered rumors as well, learning that some dragons are undead and breathe a zombie-creating gas, and that a live dragon is worth a fortune! Hjalmarr disbelieved in both. They made it up to the castle and penetrated into the depths in the same fashion as the other times - down the trap door entrance, down the hallways, and so on. They stopped briefly at an area of High Sanctity to allow Monseigneur Morgan (aka Mo Mo) to check it out. He cast Bravery on Hjalmarr, to render him immune to fear in case the dragon caused any. Mo asked for it as well, so Mo Mo cast it on him . . . and critically failed, putting him into a Panic. Mo ran. Vryce chased him down and brought back a chagrined Mo. They ended up frittering away 30 minutes resting and getting back in order, and then headed deeper. They made it to the pit down to the next level. Worried about the loss of their lightstones, they put the majority of them into a sack and had Gwynneth put Apportation on it and hold it over the open pit, a bit below the floor level. The plan was some variation of "get them down below so they can be recovered for when we fight the dragon." With that, they headed to the hot hallway and the glowing rift, and hung up a bag with even more lightstones and glow vials in it near the exit. They moved off to the natural staircase and their non-chemical lights winked out. They made it to the cave where the ravening eyes had been fought and set up a grapnel and rope and climbed down - well, Vryce climbed down, Mo climbed down carrying Gwynneth, and the rest jumped with Acrobatics or dropped from the hang. They sent Galen around exploring, and noted three ways out - one to the "right" (mostly straight) that rose up and then dropped down, through a narrow crevice (perhaps 4' wide) and two to the left. The left had a larger straight passage and a smaller side passage. hey spent 10 minutes there having Cure Disease cast on their wizard, but it didn't help her nausea and fatigue. Galen and some of the others heard what could be breathing to the "right" so they headed that way. 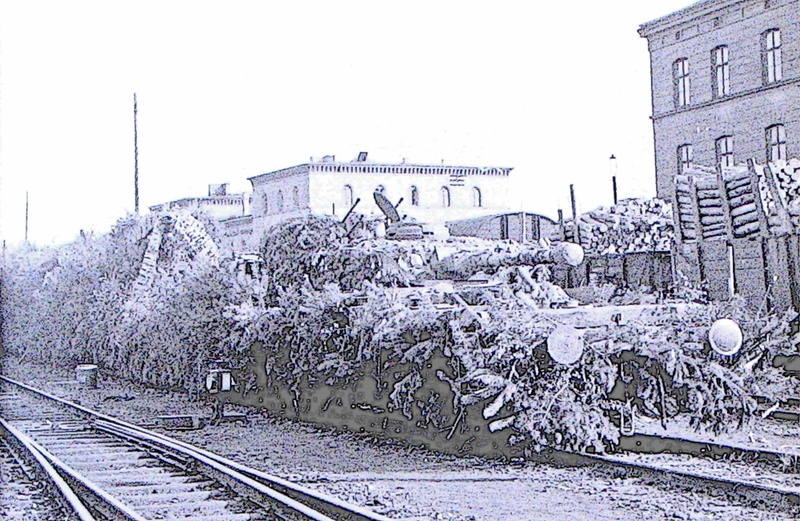 They moved through the narrow corridor and set up in the widening passage behind. They started to put on Resist Fire and other spells to deal with the dragon's breath. Soon enough, the more alert heard the sound of something big trying to sneak - but not so well that their keen ears couldn't detect it. They had Gwynneth drop her Apportation spell around now, but didn't hear the bag fall. Soon enough, spells were up for maintenance . . . and the dragon (which Galen could see with Dark Vision) was moving up. Soon it flapped up once and glided in closer. The PCs moved swiftly back, realizing they were in a dangerous funnel. They wanted to draw back and perhaps ambush the dragon as it stuck its head through the narrow portion as it looked too big to get its body through. Indecision eventually got them backed away from the entrance, and running down the side small passage to avoid the dragon. They found the same net strung across that Rolan had found a couple delves back, but the net was covered with bones set as noisemakers. They didn't want to set it off or spend the time disarming it. So they sent Hjalmarr and Galen out to circle around and see if the dragon had stuck its head through the hole. It did not, but it did clearly spot them - and growled and then roared its disapproval of their disappearance. They hurried down the big passage in the other direction, hoping to come around the dragon and attack it from a better position. They reached a large carven, with a 30' high and 30' wide plateau in front of them. Galen had heard scratching and rock noises. He also saw a gap up to the left side of the entrance. They decided that with its 60-80' ceiling this must be where the giant "floor monster" is from a previous delve. Perhaps even on top of the plateau, although they couldn't see a hole in the ceiling. They dilly-dallied around here, and the dragon again voiced some rage. As it did, gargoyles flew from the plateau and the gap to the upper left and flapped around non-threateningly. The PCs tried to decide what to do, where they were going, etc. As they did, they heard a chuckling noise. Some of them decided it came from behind them (I'm not sure why, I never specified a direction.) They hunkered down in the passage and waited. Suddenly, all their magical light sources - and other spells - ceased. They were in a No Mana Zone. They moved the scouts up a bit, and began to fire at where they saw the gargoyles. This was prompted by Alaric, who hates gargoyles and wanted to kill one. Rolan managed to hit one (with a 3) but otherwise they fired blindly. Mo yelled, "Where did that laugh come from, in front or behind?" He tossed an alchemist's fire behind the group to narrow the passage and impede anything that changed them. Half of the group turned, sure something had flanked them, or the dragon had pushed through to the "stairs room." A deep voice answered, "From behind!" - but it was clearly deeper in the cavern. Then strange rays came out of the dark and bathed a few of the PCs in strange colors. Galen was struck with Panic and ran. Vryce moved up to wait and protect Hjalmarr, who put his axe away and grabbed Rolan to drag him to safety. As that happened, a beholder floated up to just within their radius of light - clearly on purpose. It began to (randomly) fire its eye rays at the PCs. They mostly resisted, but only due to strong resistance rolls. Even so, as Mo moved up he was struck with a black ray, failed to resist, and fell stricken with a heart attack. "Elizabeth, I'm coming!" he said as he clutched his chest and fell, unconscious. "Elizabeth?" cried a distraught Gwynneth. The battle, if you can call it that, disintegrated totally. Vryce and Gwynneth both tried magic but it wouldn't work. The eye rays rained down, and Alaric was charmed even as he ran. In a moment, the beholder ordered him in Common to "kill the priest." He turned on Morgan and shot him point blank in the eye with a snake arrow. But Morgan dodged, despite needing a 7! Alaric continued to shoot him point blank, and Morgan blocked and blocked and dodge arrows. Jaspar turned and tried to strike Alaric in the arm to break it, and managed to hit him only once and just missed breaking the arm due to the owlbear cloak that Alaric wears. He tried more, but Alaric kept dodging - Jaspar was having a very tough time of it. Gwynneth tried to tack Alaric but missed. Even as this happened, Hjalmarr threw a throwing axe at the beholder even as gargoyles closed in and Vryce moved to the side to get out of the beholder's front arc. The beholder disintegrated the axe out of the air (it has some interesting/destructive parry options with its eyes.) Vryce managed to get out of its arc and his sword lit back up. He intended to use Walk on Air be before he could rush the beholder it turned on him, got him in its anti-magic gaze, and hit him with its sleep ray. Vryce failed his roll - he'd burned luck avoiding several other fight-ending effects - and fell asleep. Hjalmarr moved up and meleed a couple of gargoyles, as the beholder hovered out of reach, and managed to drop Shieldslayer when he was critically parried. Then he was hit with Panic and tried to flee. The gargoyles grabbed him but he managed keep breaking free and fled . . . only to be hit with a toxic ray and then hit with Paralysis. Galen by now was long gone. The melee in the back continued as Alaric finally got an arrow into Morgan's face and knocked him out. He stepped up and put two more arrows into the cleric and left him mortally wounded. Jaspar broke Alaric's right arm. But then as he moved away from the fray, he was charmed by a beholder ray. The beholder ordered Jaspar and Alaric to kill the wizard and then each other. They tried to attack Gwynneth but in moments she was struck by the black ray of the beholder and dropped, like her beau, with a heart attack. Alaric and Jaspar fought briefly - Jaspar managed to crack Alaric's skull and drop him, unconscious, before the beholder grew bored with that and hit him with the petrifaction ray. Jaspar turned into a statue. With that, everyone except Galen was down. Galen kept running, in the dark, feeling his way along the walls and fleeing by rote thanks to Absolute Direction. He made it to the GFS, but couldn't get the door open. Once he recovered, he headed back. He opened a glow vial and snuck back to the level below, concealing the light. He snuck back to the scene of the fight. Alaric had been bashed to death, his head caved in, his money gone and his bow and boots missing. Gwynneth was missing. Monseigneur Morgan was still alive, but too far gone - and his potions all gone but his grenades intact, and his surgical kit and esoteric medicine kit scattered. His holy symbol and necklace were gone, too. The others were all missing, and Galen was too cautious to move too close to the still-lit (by broken glow vials) mouth of the passage. He took Alaric's owlbear cloak, his snake arrows, and his Cornucopia Quiver, and cut off both of his hands. He took the loot he could from Mo Mo and headed back. Using the hands of Alaric, he could open the door to the GFS and climbed up to the mostly-silent levels. The only real threat on the levels above were the orcs, and the orcs are flat-out unwilling to come within line of sight of Galen. In the end, only Galen escaped. Eight others were dead, petrified, dying, or paralyzed/asleep and carted off by gargoyles (or, perhaps, the beholder.) The fate of the living-but-left is unknown, but bleak - there isn't any reason to suspect they still live. So, that ended badly. One of my players opined that the group immediately split between "the only way out is attack!' and "the only way out is to run!" and couldn't either win or escape with that. That may be true. It's definitely true that the PCs were not set up well for dealing with the beholder - when you're outnumbered but have magical superiority/magical supremacy narrow corridors and tight formations are helpful. When your opponent has superior power, especially area or cone based attacks, narrow corridors and tight formations are a deathtrap. Such was this, ultimately. Beholders aren't fair. They aren't remotely fair, and my version thumbs the scale down on the unfair side - a selective anti-magic cone with dangerous maledictions that aren't reduced in effect by range = nasty. I based mine entirely on the 1st edition AD&D version and the Tom Wham illustration. While I did like the "beholder as evil genius manipulator" thing in the Forgotten Realms, the really old-school AD&D feel where they'd just be wandering monsters in D1-2 and run into in dungeons and fought is the feel I like better. That's what we have here. The PCs literally got one attack off at it, and a handful at some gargoyles. I was excited to use the beholder, but I was really looking forward to the dragon fight. Oh well. I wore my Trogdor shirt and everything! One of my players has never fought a dragon in any RPG despite playing for about 30 years at this point. Well, he still hasn't. And Hjalmarr never did get to fight a dragon . . .
Usually I run fear effects as a penalty if you do anything except run. However, I specifically made an exception for the beholder, and turned it into a mental compulsion to run away at all costs. It essentially is turning the basic, standard effect of fear-type magic into a powerful upgrade for monsters that should be able to compel fleeing, just as it can compel obedience. That was, in retrospect, probably a bit too much on top of all of the other things it can do. But hey, it's what kept Galen alive! One of the players was musing about another side area to explore until replacement characters are higher point. I said that I simply don't have time for that - and it's true. I work a lot more hours than I used to, so I really don't have time to prep another adventure area. They'll have to make do with what's around now, as lethal (the depths of the megadungeon), picked-over (the Caves of Chaos), or undesirable (delving against the orcs) as those may be. What was the fate of Vryce, Hjalmarr, and Rolan? Unknown. I had them roll on the Reaction Roll Table to see what result could come - perhaps they were robbed and left, the gargoyles killed them, the beholder disintegrated them, who knows. The best roll was a paltry 13 from Rolan, which was "Good" but not that great. Hjalmarr's player used Luck (I allowed it, why not) and got 11 three times. Vryce's player used Luck as well and got 5 at worst and a 9 at best. So it's unlikely they live, but possible they still might be recoverable in some way if an expedition can recover their bodies. Or perhaps not. There are almost none left who could brave where they fell. MVP was Galen, because he lived, and he earned 2 xp total. I probably should give Mo a posthumous 1 xp for his "Elizabeth!" line. Nothing like having your beloved PC killed outright and go right to humor without missing a beat. That is what gaming is all about. We'll see what happens next. Next game session should be Gamma Terra. Thanks to Paul over at Paul's Gameblog for this one. He mentioned and linked to a site that analyzed a number of Choose Your Own Adventure books. I liked those books, and I had a few of them - I think I still have Mystery of the Maya around here somewhere. 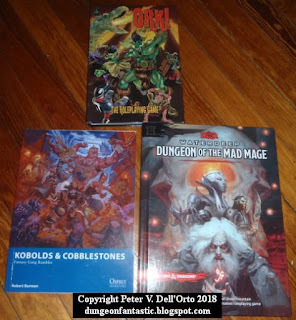 The D&D ones were a lot of fun, too, but I gave them away when I was cleaning out my book collection. I believe Dryst's player has them now, as when I brought my pile of books to be claimed, he claimed them all. I may have to try to get them back - I really enjoyed them and they influenced my games heavily when I was a tween. Whatever. The analysis of choice in these kinds of adventures is something I think about whenever I play an adventure written in this style, whether it is a CYOA book, a GURPS Conan adventure, Convoy, or an old D&D solo adventure. 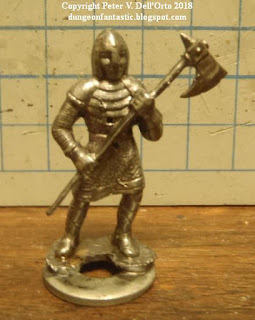 The Hundred Years War minis make excellent troops for a fantasy game - it can be hard to get good infantry with bills and voulges and crossbows. I'm responsible for a lot of the Low-Tech stuff referenced there, but I love the expanded list. I don't have much call for polearm variety in my games, but hey, I grew up speaking Gygaxese. Polearms are supposed to come in a massive, bewildering, and hair-splitting variety! - Maps are black and white and highly readable. Also, they aren't poster-sized. - levels come with a preamble telling you what you'll find - and good ones, at that! Very useful for OPM. - room descriptions are minimal, just enough to work with. - maps that include levels with multi-level structures on them, and many connection points. - pages 5-12 are intro, adventure seeds, necessary prelims, etc. and then it gets right to the dungeon. - play supports PCs getting in over the heads, and moving "ahead" of their level-appropriate challenges (and back-sweeping, as well.) Nice. - lots of adventure seeds to give you reasons to keep going down - and have focused exploration - besides just "we need to get some XP and gold!" - more monsters, including the creepy lava children from the Fiend Folio! - "Each dungeon level contains enough monster XP to ensure that characters who clear out the level can advance to the point where they're ready to take on the challenges of the next level down." I have very definite feelings about megadungeons as ones you don't go around clearing level by level. You can, I think, but basically want to in order to make it through? Ugh. - I personally still have an issue with the whole "pit to the dungeon in the middle of the Yawning Portal tavern." Really? You let people go down and stir up dangerous monsters in a big hole in the middle of the floor? You bet on their success and failure and let them die screaming below because they don't have the money to come back up? In my book that isn't "Neutral," that's flat-out Evil. Evil stands by and watches you die because you can't cough up a coin right now. Even Roman gladiatorial games seem less cruel. So far, I generally like it, and while I won't run a D&D5 game, I will use some of what I like from this in my own GURPS game. I looted well this Christmas! Ork! The Roleplaying Game 2nd edition - I ran a memorable game of Ork! first edition during some Christmas gaming many years back. Kobolds & Cobblestones - a minis skirmish game from Osprey. Dungeons of the Mad Mage - a 5th edition D&D Megadungeon, and I was pleased to note that Greg's friend James Introcaso was credited in it. Pretty exciting stuff. As a megadungeon GM, Ork fan, and minis painter, this is a great haul. I also got some other very nice stuff that wasn't gaming related, but that's so off topic. May your loot be untrapped and copious, and sufficient to reach your loot threshold, bring you to 1 xp shy of 2 levels above your current level, or be cool gaming material. Or all three. DF Felltower: Where are the hirelings at? Recent play in Felltower hasn't featured many hirelings. The last Ally featured was Brother Ike, who was chewed into a shower of gore and gobbets of flesh by a ravening eye. The last non-Ally NPC to delve was Raggi, who hasn't been actively sought after once it was clear that the dungeon's lethality has exceeded his ability to survive. Some of this is the struggle of players to recognize what lower-point NPCs are good for. We're usually running at above 6 players per session. 8-9 isn't uncommon anymore. Because of that, the game just doesn't feature a lot of NPCs. The PCs don't seek them out, the offered potential loot is lower. 2) Too little GM time. I don't have a lot of spare time. I don't sit around writing up NPCs. I specifically don't want to avail myself of the free time of my players to have them make up guys who just happen to be standing around town, waiting to get hired. The abuses in that are so obvious that spelling them out seems insulting to my audience and wasteful of the rest of my time. But because of that, I don't have NPCs ready to go at the last minute. This means the players need to decide long in advance they want, say, a wizard or an archer or an acolyte. They usually want a loyal, cheap, highly effective healing priest. They'vew gotten 100% of them killed beyond Resurrection, though, so that's a tough call. Plus the group tends to maximize loot thresholds over fighting evil, which means the church isn't going to give them a bonus to the roll to encourage a priest to join them for certain eventual death. For the same reason you haven't seen much of Raggi, you won't see much of 62-point hirelings and unknown point volunteers. It's very, very dangerous on the levels of Felltower the party is going to. Promised rewards haven't increased, but lethality has. In fact, actual rewards taken home by the NPCs has generally dropped. More of them have died, mostly permanently, and few of them have received anything like substantial rewards for the risk. Plus too many of the PCs have reputations for either attempting to murder the NPCs (the Barca family, for example) or short-shrifting NPCs who don't turn out to be decisively useful. A couple of PCs have positive modifiers thanks to Reputation, but net/net most of them have minuses. So, much more risk of death for less reward than there was for less risk. All in all, though, as much as I love hirelings, there isn't a lot of reason why they're going to show up. Unless the players and their PCs make a much more certain effort to attract them and retain them, it's likely to be a PC-only party for a while. 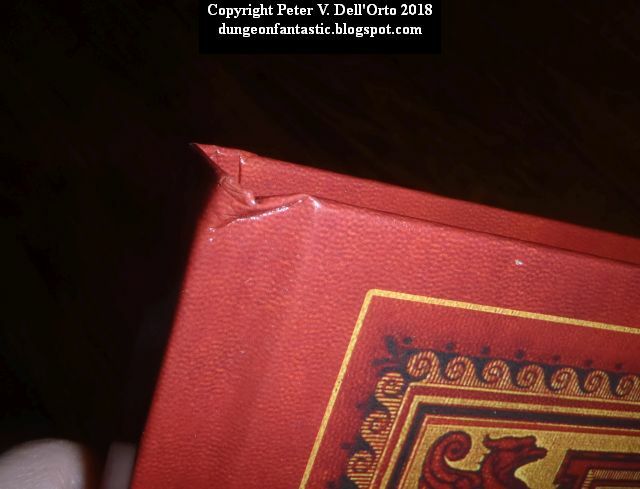 Yesterday I complained about my arrived-dented Advanced Labyrinth Lord book. I contacted DriveThru RPG about this, and they've put in a replacement order for me. So, hurrah! That was prompt and makes me happy. Hopefully the next one will come with the same cover and no dents. I received my brand-new copy of Advanced Labyrinth Lord, hurrah! But it arrived with dented corners. GRRR. 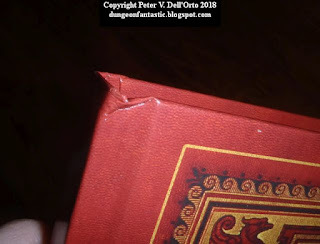 I'm going to complain to DriveThruRPG about this. This should not be acceptable - a print-on-demand book with dented corners? It's not even brand new and mint condition when it's printed out for me? That leaves a really bad taste in my mouth. 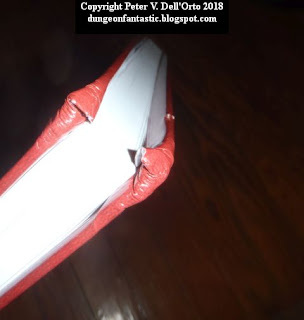 I don't mind dented books, if either I dented them or I bought them used. I expected new, here. Matt "I wrote like 10,000 articles" Riggsby has a few things to say about the end of the third iteration of Pyramid magazine. I wrote a number of articles for Pyramid, both in its second and third iterations. I submitted an article for its first iteration, the paper one, but it was rejected and sent back for revision. I revised it and sent it in, but somehow the revision got lost . . . but the next editor, Steven Marsh, picked it up as originally written for the 2nd edition. So clearly it wasn't that bad; maybe just Scott Haring didn't like it as much as Steven did. Either way, I wrote some articles for the weekly online version of Pyramid. It transitioned eventually to the PDF version. I started writing for that soon after that happened, getting my first article in the new edition with issue 3/03 and "Deathball." It's sad to see it gone. The PDFs will always be out there, which is probably part of the good and bad of it. The good, because you can always get a back issue. The bad, because it was easy to just ignore it and go back later when you needed a piece. The long tail is nice, but it's rough on the publisher in a lot of ways. The lack of push to get the new issue now, while you can, has to be part of that. Sales almost certainly didn't match the needs. So it ends. I updated the Monsters Encountered List and the Gates list tonight. Also, the Known Dragons page. Just FYI, that's where I spent my short Wednesday blogging time. Amazon.com (that's my affiliate link) has a code going for $5 in promotional credit if you buy $20+ of books. Just put GIFTBOOK18 in the Gift Cards or Codes box during checkout. Tenkar has a list of D&D books up that are covered by this, but it'll apply to many, many books. Don't miss it - I almost overlooked it myself while Christmas shopping. Over on Back to the Dungeon, Eldrad wrote about old-school gaming style with the newest of the D&D rules, 5th edition. I would sum that up as, it's not as much the the rules, as it is how you play them. My own GURPS game is an example of this. It's hard to die in GURPS, even though combat is potentially lethal. It's easy to spam out magic and rest and recover from injury - so much so that the rules have their own special cases to limit that. It's a skill-based system with non-random character generation, something that dates back to prior to much of the old school games but yet is mostly associated with newer school games. Given all that, you should really need to house rule the hell out of GURPS to make it play lethally, right? Not really. The campaign graveyard is full to bursting. The PCs risk death every delve. They can't rely on rests any more than Eldrad's PCs can rely on a short rest when it's convenient. Rules have a heavy influence on how the game runs, but you can run a game in a style that changes that. PCs have been able to buy custom magic items since the start of my DF Felltower campaign. The upside of that method is that it's very rules consistent with enchantment in GURPS in general. The downside is that I need to know the energy cost of a magic item, then figure from that. Not a big step, or a complex one, but it is a extra step. Divide the $ cost of all enchantments by 100. This is the number of days before the magic item is complete. Minimum is one day. This is slower - a lot slower for very big items. But it does make things really, really simple. Instead of a 500 energy item costing $10,000 and taking 500/6 = 83.33 days, it's $10,000 / 100 = 100 days. Done. It also pushes more in the direction I've been leaning more and more the whole game - find it, don't buy it. We also play a little less often thanks to my schedule and some unfortunate placements of holidays, plus occasional forays into Gamma Terra and AD&D. Net/net, it makes my life easier and that of the players, also, at a relatively minor cost to the characters. And really, if you absolutely need a magic item to be done now, there is always the option of a trip to Black Jans, a quick in-town based reaction roll*, and payment of double cost. * So guys who don't hang around in town, or piled up a bunch of "free" disadvantages like Intolerance (Urbanites), Overconfidence, Odious Personal Habit, etc. don't have as much access to this as others do. And those who invested points in Reputation, Charisma, etc. or spend extra money in town get another benefit for doing so. I picked up, and finally read, the Pagoda of Worlds. Brief review: It's cool, and I want to see what I can use from it. You'll have to wait for a longer one for when I have some free time to put words down this week! Anyone know the origin of this guy? 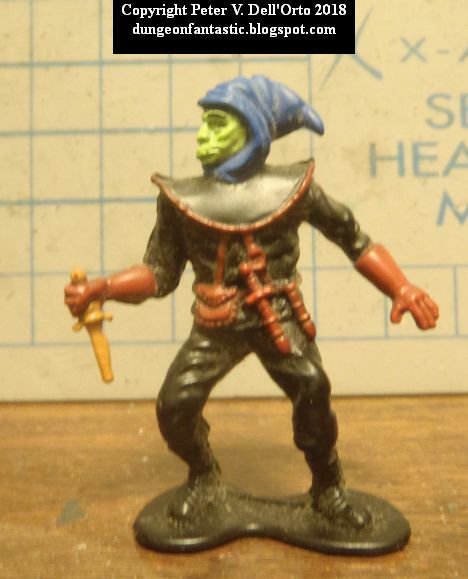 I think he's the half-orc assassin from the LJN toy line, but I don't know for sure. 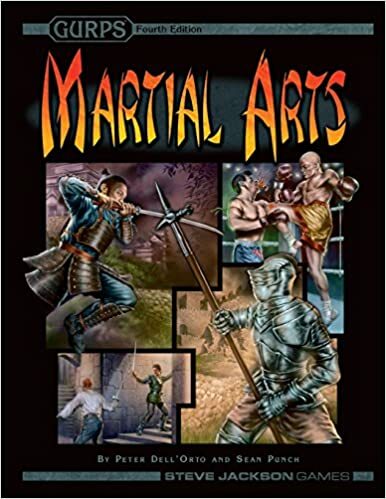 Back in 2005 or so, I did the style writeups for Kachin Bando and Lethwei for GURPS Martial Arts. Those two writeups hold a special place in my heart, as I learned Kachin Bando from Phil Dunlap in Mahwah, NJ as a result of discovering him while researching the book. That led to my full-contact MMA matches, and those were very important in my life. In any case, there is a big Lethwei rematch coming up, between Myanmar's Tun Tun Min and Canada's Dave Leduc. I watched both of their previous matches because, a) it's Lethwei, and b) it's easy for me to root for a rangy North American. - a strong emphasis on attacks that are Committed Attacks and All-Out Attacks - all of which look more like (Strong) than anything else. This is strongly advised as a way to play a character with the style in the writeup for Kachin Bando (p. 152). - I didn't see much that looked like a Feint, which is something that my Muay Thai instructor in Japan taught me to use, but didn't show up in my Kachin Bando instruction at all. Even the spinning elbows look more like AOA (Strong) than the combination feint-attack that they are statted up as. About the only thing that might qualify is Dave Leduc's low-high changeup kick. - You clearly need extra FP and HP for these fights, and Fit, and Damage Resistance (Tough Skin) wouldn't hurt, either. Hard to Subdue seems useful, and likely - both fighters take some hits that could floor a fighter and they shrug them off short-term. The whole list of advantages in Kachin Bando is a good buy, and seem like good in-game choices to reflect the fighters. - clearly some of the rules have changed from the Lethwei writeup (p. 186) with a 5-round championship and purely timed rounds. - similarly, it's win-lose-draw, and it's not decided by judges, scorecards, or anything else but in-ring violence. Submit or incapacitate your opponent if you want to win. and yes, they'll revive you after you go down and see if you want to continue. like here. - the fights have a lot of short spurts of action, much like any other competitive fight. The rules for Tournament Combat (p. 134) would represent this well. - towers, pyramids, and ziggurats within large caverns/rooms/etc. Embrace the size of the dungeon and show it off with multi-level structures. This is where your side view and top-down view both come in handy for placement. Make sure you aren't accidentally having pits impinge on open areas on a lower level, staircases that bypass a level but are blocked (or opened to) by an intervening level, and so on. Using large structures and multi-level connections, and pits down to deeper levels, is a great way to take advantage of the megadungeon . . . but do it on purpose rather than by unhappy, oops-my-map-is-wrong mistake. Thanks again to Darnizhaan for bringing these up! It's been a while since I put up some megadungeon "best practices." I've discovered a few more in the process of designing, running, and maintaining my megadungeon, Felltower. Providing alternative ways to get around a dungeon is great. Providing distractions and false paths adds to the dungeon experience. But, in general, avoid too many useless choices. That is, a choice between A and B when A and B end up the same way. Two hallways leading to the same area is generally okay, but two doors to the same room, from the same other room? Useless. It just kills the most valuable resource - real world playing time. Provide alternatives without providing an excess of choices that don't actually make a real difference. Avoiding this is as simple as asking yourself - is this an alternative, or a choice that won't matter in actual play? Players are resourceful, and some game systems - GURPS is one of them - provide them with a lot of resources for making their own passages in a dungeon - Shape Earth - or determining where to go - Pathfinder, Seek Earth. The depth between levels, the relative angle of passages, the nearest source of X from area Y - you'll need to know these. It's worthwhile to note this on your GM master maps so you don't get stuck when the PCs need to know how far down stairs go, the depth of a shaft, the thickness of a floor, etc. I had some issues with the set, mostly because the expansions assumed you had the three-book Deluxe Traveller boxed set. I paid $12 for the Starter set because $20 was crazy expensive for me. Even $12 was pocketbook breaking at the time, and cost me a lot of allowance. So I felt really burned when I'd get later books and they'd reference different books . . . Still, it's a nice little set and it did get me going on Traveller. While it's free, just grab it. Me, I'm hoping for both a successful and fun delve. One thing about such a delve, though, is that the PCs still don't entirely know how to handle dragons. They've heard about needing dragon-slaying swords, or an arrow to a vulnerable spot (but not just any arrow, one particular arrow) but don't know if that's true. They've heard you can capture dragons and sell them . . . but don't know if that is true. They are stockpiling spellstones with such spells, plus healing, plus mundane tools to carve up a dead dragon, plus potions, plus anything else they can think of. They've making their lists and checking them twice, as the season requires. Me, I've long ago made up that dragon . . . and I can't wait to see how it all turns out. I will admit this right out - I am out on this one. I have the original version, and I really don't need an expanded version . . . nevermind something I can't just use directly with GURPS. I'm saving my funds for the Dragon Heresy full set hardcopy. But if you like Vikings, and run either D&D 5th edition or Swords & Wizardry, take a look - Doug produces high-quality gaming supplements. A couple years back I bought some game sets to drop off for Toys for Tots. Any other good potential gaming options to give away? I was a peer reviewer for it, so I received a complimentary copy. It came out pretty neat based on my first glance-through. It seems like I should have a bit to potentially plunder for another game since MH isn't really my type of game to run. A session or so back, the PCs were menaced by some golems. These guys are actually some plastic knights from some random bag of plastic men - knights in this case - that I had when I was a kid. Few survived, but those that did have become golems. All I did was spray-prime them, cover them with metallic paint, and then either just magic wash them or give them a rust-orange wash and then magic wash them. Simple, cheap, fun, and just the right size to be SM +1 menaces. That guy also got a carpet staple in his chest, somehow, which I pried out. It just makes him look battle-damaged. Aim for the hole at -8, you can see how well that worked out for the delver who put that hole there! So you want to follow the jokes at the gaming table . . .
Samurai Cat (for "not even the glyphs." You'd think those would come up more often, but they really don't. Something like half of the stupid stuff we say at the table is The Three Amigos . . .
- there is no pure good and pure evil, but lots of shades of grey. That's how I generally run my games. There is absolutely pure good in Felltower. Not just good-hearted people who do good things, but there is the Good God. The Good God is pure good. He might smite things, but generally smites things of Evil or which will lead to Evil. There are artifacts of Good. There are places of Good, too, that cause harm to those of evil and discomfort to those who stray too close to Evil. PCs can push heavily towards Good, but won't necessarily reach pure good. They can try, and they can be an instrument of pure good. Good is heavily tied towards order, sacrifice, and civilized behavior, and bravery. Nature has much to do with Good, too. Pure Good is generally outnumbered by evil, but, contrary to the belief of most, it's more powerful than evil. Partly this is because of the raw power of good, and the powers of good, but also because Evil's power largely comes from deceit, giving in to temptations and weaknesses, and fear. Good can rely on trust, friendship, and redemption. There is absolutely pure Evil in Felltower, too. Demonic/diabolical beings, The Enemy, and folks who perpetrate deeply evil behavior are Evil. Evil is heavily tied towards chaos, selfishness, uncivilized behavior, and atrocity. It's not necessarily cowardly, but fear (both causing and feeling it) are core values of Evil. Evil's inherent weakness is that while Good can cooperate, Evil ultimately can't trust other Evil. Evil talks a good game about rewards, but you can't trust Evil to come through on anything that isn't self-serving to the being or force making the offer. It's a shortcut to power, and like all such shortcuts, contains the seeds of its own corruption. Some beings, like Elder Things, may not be evil, but for all intents and purposes are Chaos personified. And Chaos is tied to Evil by behavior, no matter what its inscrutable purpose really is. So backers got the Advanced Labyrinth Lord PDF today. Well, maybe before today, but I got it today. I felt that was the most clearly awesome one. It's nice to have LL and the Advanced Edition Companion in one volume. I am not sure I will ever run the game, but I do like it and I like browsing it.